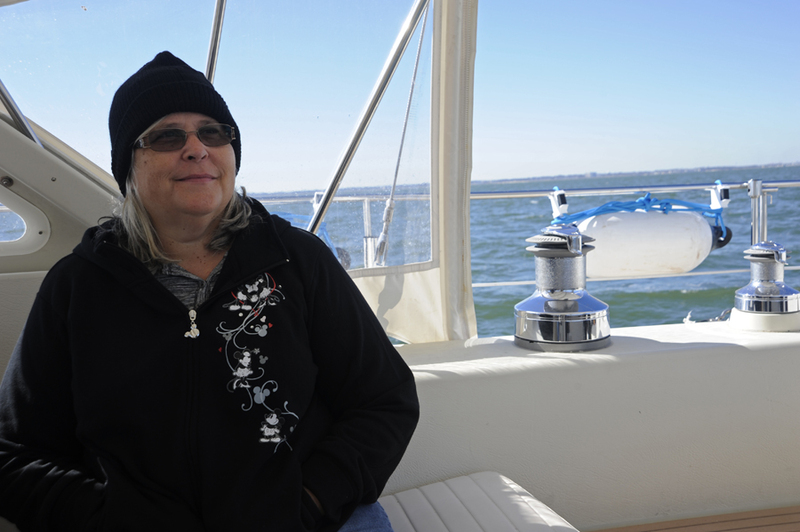 We didn’t see dolphins inside the Chesapeake Bay the entire time we were there. We think it is because there are too many crabs, flies and jellyfish. Other sailors said they saw dolphins but we are skeptical. 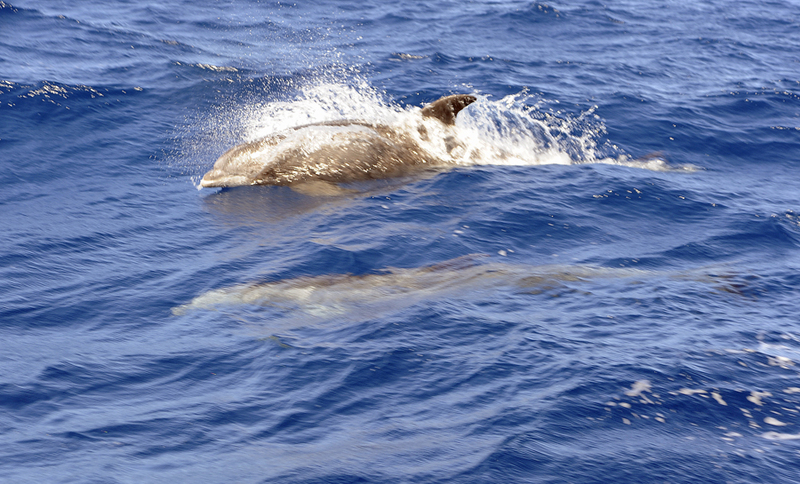 One of the pure joys of sailing a boat is when dolphins come up and play. The moment we passed over the Chesapeake Bay bridge tunnel, we were greeted in the North Atlantic Ocean by dolphins. Welcome back Cream Puff. Let’s play! The weather turned chilly in Hampton VA. We turned the heat on one night when the low was in the mid 40’s. 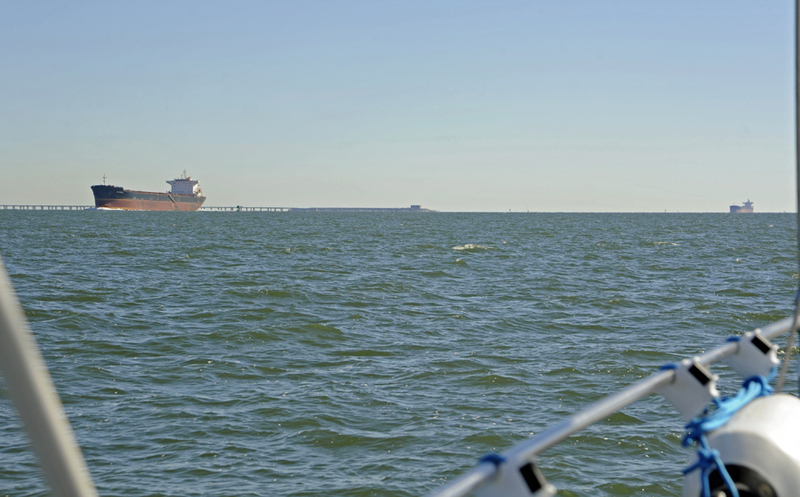 We departed Hampton VA on Tuesday after seeing a great weather window to round the daunting Cape Hatteras. Because of the crappy weather of the last few weeks, the marina was jammed full of boats waiting to head south. Many planned to take the route of the Intracoastal Waterway (ICW). Due to the heavy rains in the Carolinas, many areas of the ICW were impacted. Word was making its way north about a backlog of boats stuck trying to get under bridges with high water and shoaling. The shoaling was caused by the run off from the heavy rains. The ICW is not an option for us. Our mast is 67 feet tall. The standard bridge height on the ICW is 65 feet. We are often asked why we purchased a boat that is not ICW friendly (meaning the mast would be less than 65 feet and the draft less than 6 feet). 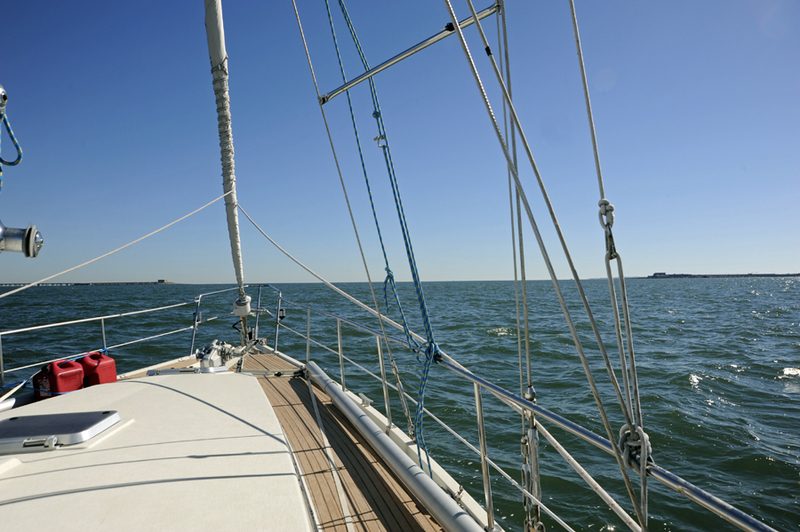 Our quick answer is we wanted a boat that was the most seaworthy and would take us safely anywhere in the world. We based our decision to purchase an Amel beyond one piece of local geographic waterway. Perhaps one day we would like to cruise the ICW. If we do, we will purchase a powerboat since motoring seems to be the main means of propulsion on the ICW. Another thing we are often asked by people who do not fully understand sailing is if we sail at night time. The answer is yes. If we were doing the ICW, we would have to stop at night as the ICW winds about and a skipper needs to see channel markers in order to stay in the deeper water channel. 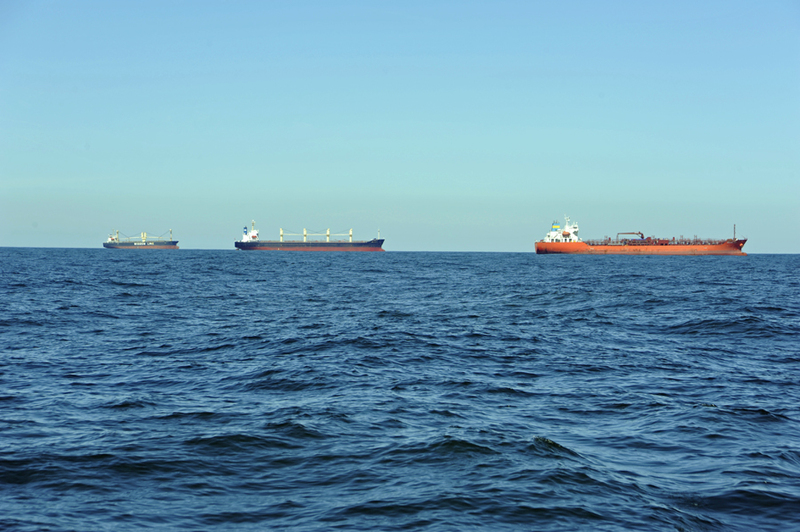 At sea, we do not worry about seeing channel markers. We worry instead about other boats, ships and floating debris. We use our AIS and radar to see at night. AIS can see further than we can, even during the day. Looking at our AIS display, we were not the only people taking advantage of the weather window to go south. We counted eight other boats with us off the Virginia coast. These are only the boats owners who have opted to purchases AIS. We saw quite a few others on radar not transmitting an AIS signal. As we set sail, our planned destination was Winyah Bay near Georgetown SC. This quickly changed. We thought we would then hop to Charleston SC on this trip. That also changed. Early Wednesday morning we rounded Cape Hatteras and received a weather update. The weather is usually very accurate for up to a 3 day forecast. We still very much consider ourselves novice sailors and avoid any possibility of stormy weather. We get daily weather updates via our satellite phone and SSB radio while offshore. We make sure we have planned “safe harbors” we can duck into if the weather forecast looks too ominous. During this trip the weather kept getting better and better. By Wednesday afternoon we decided to push on past Georgetown. We informed Mona who is our land contact and keeps track of our float plan of our updated destination. Thursday morning started with a delicious breakfast of scrambled eggs and toast with red current jam. Red current jam is a yummy British product that is one of my favorites. This year while in Annapolis, Cindy surprised me with a jar on my birthday. Cindy had kept this tasty little treat hidden aboard since buying it at a store during our visit to Onancock. If you haven’t ever tried red current jam, you should. Breakfast was followed by a desert of chocolate M and M’s. M and M’s for breakfast isn’t as unusual as you might think. Let me explain. Once we are at sea for more than a couple of days our routines become very opposite. We spend our time underway as follows: On watch, eating and drinking, sleeping, bathing or taking care of bodily functions. If on watch, this person is responsible for making course adjustments, trimming sails, looking for traffic and ensuring the safety of the ship. Because we take turns doing this, our sleeping schedules quickly become very opposite. What might be breakfast for me could be lunch or dinner for Cindy. If one of us cooks a meal, the other usually participates. Sometimes beef stew or lasagna is breakfast. Sometimes it is dinner. It really doesn’t matter. What matters most is it stays down. During a time when we were both awake we swapped dolphin stories. I watched under the moonlight as a small pod that played with us. It was about two o’clock in the morning and they hung around the boat for a good half hour before setting their sights on something more mischievous. Cindy told me about a family that came to visit. They had a small calf. She said the mom looked like she was teaching it how to play in the surf and wake. The baby came out of the water and landed sideways a few times. What fun. Thursday we decided to sail past Charleston. We have visited Charleston many times and love the historic area. But, the city marina there is very expensive. We didn’t “need” to stop although it would have been fun. If we did stop, we were not sure how long the weather would allow us to keep going south. We opted to save the money and continued to take advantage of the great weather. We notified Mona of our new float plan. I think at this point Mona was wondering if we would ever make landfall. For a brief second, we talked about the possibility of just going straight to the Bahamas. It was a brief fleeting comment by me that picked up no traction. We landed in Florida. Yes, we sailed over 600 miles in five days. Here we will wait until we have another good window allowing us to cross the Gulf-stream and then onto the Bahamas. Our lifestyle and travel is pretty much dictated by weather conditions. This time around the weather was in our favor. We put away the cold weather clothes again and are back to shorts and tee-shirts.